A Malden man was arraigned yesterday for Carjacking charges in Boston Municipal Court for allegedly accosting an Arlington woman in a parking garage in the early afternoon hours on Monday. Michael Fitzpatrick, 52, of Malden, allegedly pointed a handgun at her and demanded her car. The woman complied with the demand and threw her keys at him before running away. Two other women witnessed the incident and safeguarded the victim in their vehicle before driving away. When they reached the cashier’s gate of the garage, however, the carjacker drove up behind them and smashed through the entrance gate to exit the garage. Not too long thereafter, Michael Fitzpatrick collided with a taxi cab at North Street and Cross Street in Boston. He drove away from that crash before again crashing, this time with a tree on Commercial Street in Boston, Massachusetts. At his arraignment, Fitzpatrick was ordered to submit to a Competency Evaluation and was seen by a Court Psychiatrist, where it was discovered that he is an alcoholic, consuming nearly half a gallon of vodka daily. The carjacker, it turns out, also had two other pending criminal matters, a drunk driving case out of Orange District Court, and an assault case in Quincy District Court. At his Bail Hearing, the Suffolk County District Attorney told the Judge that Fitzpatrick’s criminal record includes a history of violence, convictions in Virginia, Florida and 16 criminal convictions in Massachusetts. He was held on $100,000 bail. Read more on this story by Milton Valencia & John Ellement, Globe Staff. 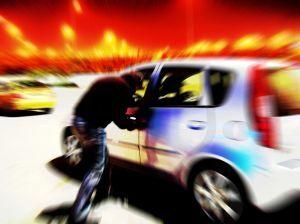 That the defendant assaulted, confined, maimed or put the victim in fear for the purpose of stealing the motor vehicle. At trial, the prosecutor does not need to prove that the defendant was successful in his attempts to steal the car; only that the defendant attempted to do so, even though he might have failed in his attempt. Assault is defined by Massachusetts law as an attempt or offer to do bodily injury to another by force or violence; or putting a person in fear of immediate bodily injury. If you have been charged or arrested for a criminal offense, you need to speak with an experience criminal defense attorney who knows how to protect your legal rights. To speak with Massachusetts Criminal Defense Attorney Lefteris K. Travayiakis, e-mail or call him directly at 617-325-9500.